Beware...these things are rich! But oh, are they good. 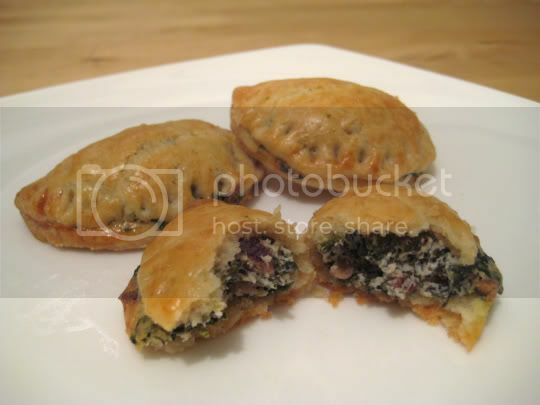 A simple filling of chopped spinach (the frozen kind that needs to be thawed and squeezed out), an entire round of garlic-herb Boursin cheese, and chopped pecans is mixed together and stuffed into dough rounds made from pie crust (or puff pastry) and baked. A simple egg wash provides the nice golden color and outer crispiness. The pie crust will also determine how rich these puffs are; I used frozen 10" pie crusts from Trader Joe's, which were very rich on their own. They were also slightly sweet, which I would not suggest for a recipe as savory as this one. Maybe puff pastry would have been better. A MAJOR recipe revision is needed here, however. The taste and flavor is fine, no complaints at all (other than the sweet pie crust). But the amounts are all off. Using two 10" pie crusts (the recipe suggest 9") yielded me about 36 2-1/2" dough rounds...and the filling is the exact amount to fill all 36 of these! Yet, the recipe suggests serving one per person and that there are 12 servings. Strange. Make again? Definitely. Great for a party...although assembly and prep are rather time-consuming, but they can be prepared ahead of time and baked later. Also, use puff pastry.